Opening June 25, The Collaborative Print: Works from SOLO Impression promises to engage viewers of every stripe. More than 40 lithographs and embroidered works represent the close relationship between printer and artist and span a range of artists including Louise Bourgeois, Maya Lin, Jean Shin, and Nancy Spero. Solodkin also shares ties with another artist whose work will on view at NMWA starting this Friday: June Wayne. As founder of the Tamarind Lithography workshop in Los Angeles (later the Tamarind Institute in Albuquerque where Solodkin studied), Wayne blazed a trail for women printmakers. Though the two never worked together at Tamarind, they later collaborated in the 1990s on a series of Wayne’s science-inspired prints Near Miss, Nacelle, and Knockout. Be sure to visit NMWA to see The Collaborative Print and continue to check in with “Broad Strokes” later this summer for SOLO artist profiles! 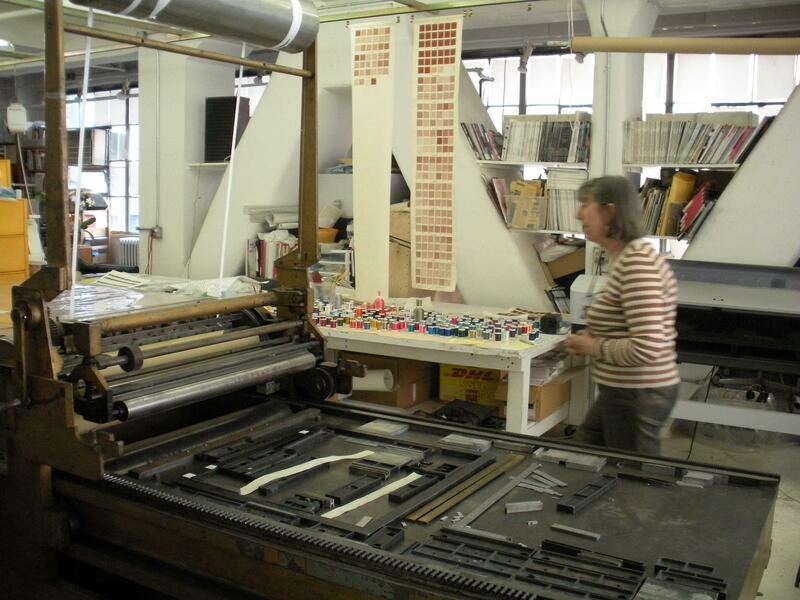 Master Printer Judith Solodkin in her printing studio in New York City. SOLO has lithograph and inket printers, letterpress, and most recently an embroidery station. -Rebecca Park is Publications Intern at the National Museum of Women in the Arts. Quotes and photo from an interview between Vivian Djen and Judith Solodkin in April 2010. This entry was posted in Artist Spotlight, Behind the Scenes, NMWA Exhibitions by Women in the arts. Bookmark the permalink.